cFos Notifier supports POP3 and IMAP. Enter your mail server, user name and password for the account setup. cFos Notifier tries to detect your mail server account settings automatically. Use server:port if you use a non-standard port. cFos Notifier prefers encrypted connections over unencrypted connections and IMAP over POP3 because of IMAP's faster mail check. You can enforce encrypted connections and also allow self-signed certificates. However keep in mind, that a self-signed certificate can easily be forged by an attacker who then can listen in to your traffic. cFos Notifier uses OAuth. At first startup you need to authorize cFos Notifier to access your Twitter account. You don't have to give cFos Notifier your user name or password. When first started, Twitter asks you, if you allow cFos Notifier to access your account and gives you a PIN. You must enter this PIN into cFos Notifier's input box. cFos Notifier then gets an access token, which you can revoke at any time. cFos Notifier supports Lists. On Twitter you can set up lists of people you want to follow. If you have configured such lists, cFos Notifier can display them in its context menu. You can select which lists cFos Notifier should check. 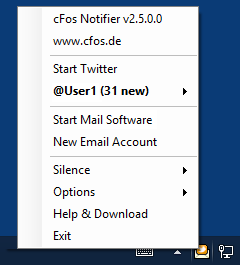 This allows you to use cFos Notifier only for a subset of your incoming Tweets. 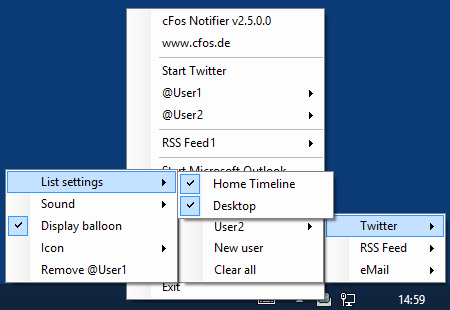 cFos Notifier currently supports RSS 2.0 feeds. Many news pages and forums offer their content as RSS feeds. Just enter the RSS 2.0 feed URL to add a new feed. Please let us know, if there is a popular feed which cFos Notifier doesn't seem to understand (leave a message using our contact form ). For each source you can configure the notification sound, if a balloon tip is displayed and an optional taskbar icon overlay. If you use many sources we recommend to turn off the sound and the balloon tip for the sources except for the most important sources. When you open the context menu to get an overview of the news, cFos Notifier will mark new sources in bold. As soon as you open the corresponding sub-menu, all entries in it will be marked as read. To keep them as unread you can open the sub-menu while keeping the CTRL key pressed. When you click on an RSS feed entry, you open the web page for that RSS entry. When you click on a Tweet, you open the Tweet details page where you can interact with that tweet, e.g. retweet it, add to favorites, etc. Clicking on the title of the sub-menu either starts Twitter, your email client or the RSS feed overview page. We also use Twitter as a way to inform our followers about news, like new program releases, new products, sales, etc. To use cFos Notifier to follow us on Twitter is optimal to stay in touch with us.